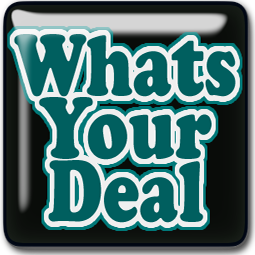 Here at WYD (What’s Your Deal) We are commited in making sure our members have the most accurate information and a complete understandiang of couponing. We wanted to put together a helpful guide on how to shop a Kroger Mega Event for those of you that are new to couponing and/or couponing at a Kroger Mega Event. WHAT IS A KROGER MEGA EVENT? A Kroger Mega Event is a promotion that Kroger does several times a year. Mega Events usually run for 2 weeks and will vary each time. 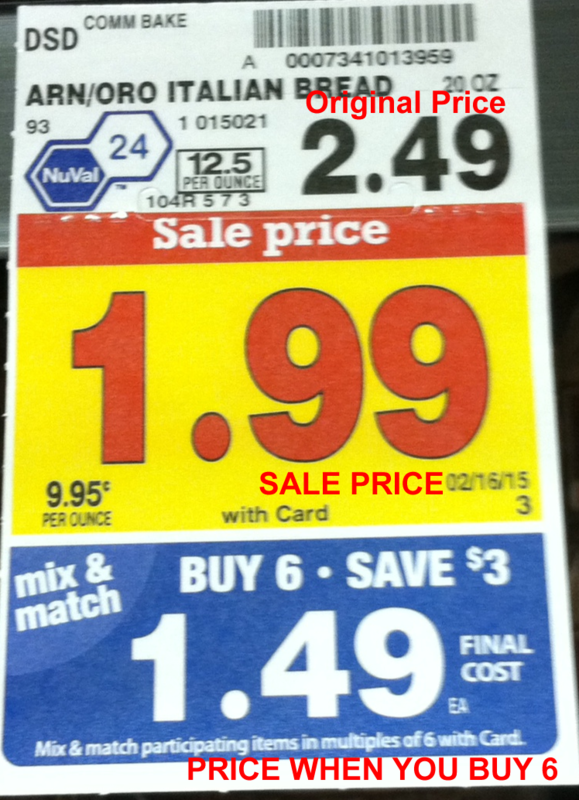 You may see a “Buy 4 Save $4”, “Buy 5 Save $5”, “Buy 10 Save $6″…ect. You MUST purchase the quantity of items for that particular promotion. As an Example: Buy 5 Save $5 Event, you MUST purchase items marked with this promotion in multiples of 5 in the same transaction, you can mix and match items that are part of this promotion. Check your Kroger ad or See WYD’s Coupon Matchups Here and make a list of the items you would like to purchase. Check WYD’s database, your Kroger Plus card or print coupons here for coupons that go with the items you have on your list. Plan and organize your shopping plan. Make sure you have a backup plan just in case some items are out of stock. Keep your coupons that you are using (items already in your cart) organized. I use a paperclip and paperclip the ones I am forsure using together. Checkout time – Count your Mega Event items as you place them on the belt for checkout. This is to double check that you have the correct number of items for the promotion. I always hand over my Kroger card first so that I can watch the screen to make sure that the items are ringing the Mega Event Price. Plus, this allows me to see my total before any coupons come off. After all items are rung up, hand over your coupons. After you have paid for your order check over your receipt, just to double check everything came off correctly. Its better to know while still in the store than after you get home. 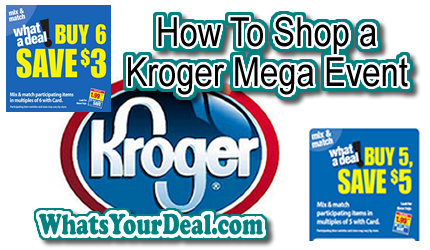 Kroger Mega Events are a GREAT way to stock up on items and get a stockpile going. (Q) Is there a limit to how many Mega Event items I can purchase in 1 trip? (A) No, You can purchase any of the items in the Mega Event as long as you purchase in the required multiples. If you are using coupons, you will still need to stay within the stated limit on the coupon or your stores coupon limit. Check with your local store if you would like to purchase in BULK quantities. Most stores will order bulk quantities for you and allow you to use larger amounts of a single coupon. (Q) Do I need to purchase all of the same items? (A) No, you can mix and match any of the items as long as they are included in the promotion. You MUST purchase the quantity of items for that particular promotion to receive the promotional price. (Q) How do I keep track of how many Mega Event items I have? (Q) If at Checkout I realize my count is off, what should I do? If you have paid, you can go to customer service and return the items, then you may repurchase them with added items or choose to come back another time to purchase. (Q) Do clearance items get the mega event savings? (A) YES, and I love when this happens. As long as you purchase in the correct multiples for the promotion the mega discount will apply to the clearance. **NOTE – I hope this has answered alot of the questions asked about a Kroger Mega Event. If you still have question feel free to message me or ask in the groups, WYD has the BEST members that are always willing to help.